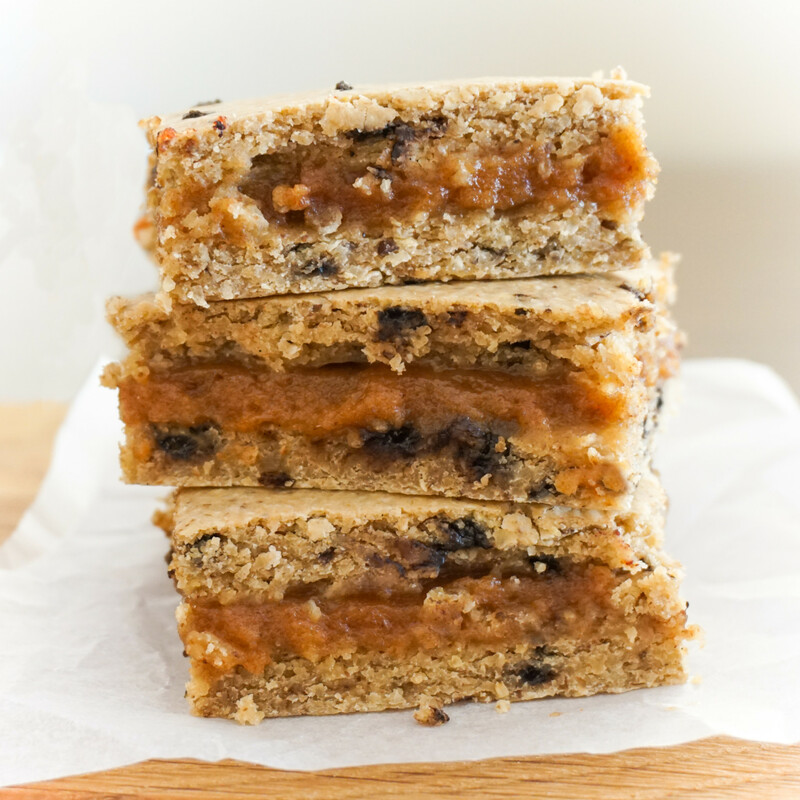 The layer of healthy salted caramel sauce, which is sandwiched between layers of my favourite chocolate chip cookie dough, brings this recipe to a whole new level! 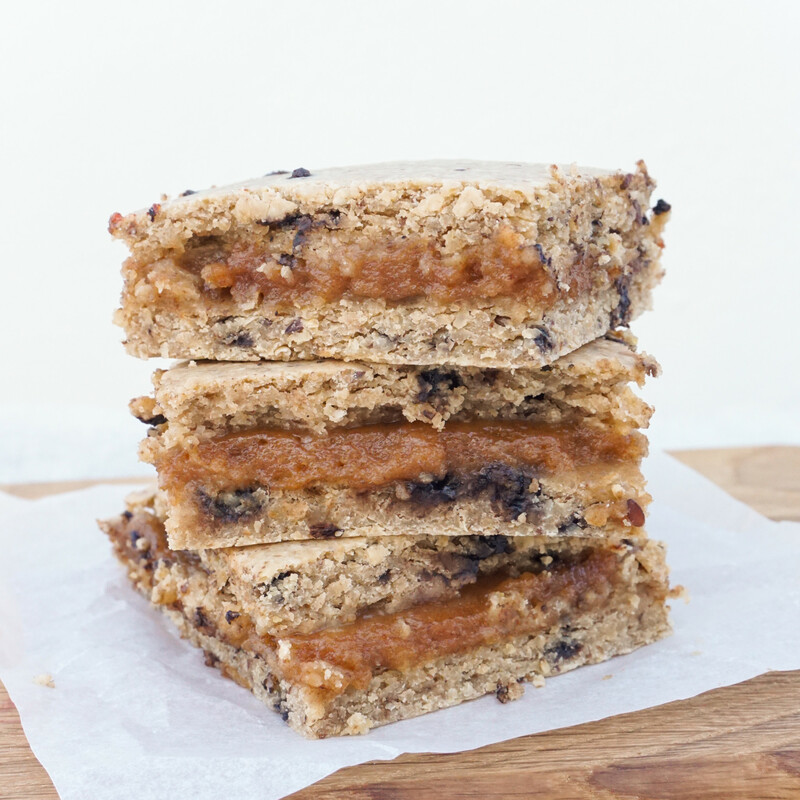 It’s not only extremely tasty, but also super gooey, nutty and sweet, combined with a touch of saltiness. So if you’re a big fan of chocolate chip cookie dough, caramel sauce, and sweet and salty combinations – this one’s for you! Plus these salted caramel almond blondies are incredibly easy to throw together, all you need is a high-speed blender, a brownie tin and you’re set. They’re best when they come fresh out of the oven and are still warm, but also keep perfectly at room temperature. Place all the ingredients for the dough inside a medium sized bowl and lastly add the flax eggs. Use a spatula and your hands to combine the ingredients to a soft dough. It shouldn't be too dry, and not too sticky, but just right so it won't stick to your hands. Use a knife to cut the dough into two equal parts. Pre heat the oven to 180°C/ 355°F and line a brownie tin with parchment paper. Take the first half and spread it evenly on the bottom of the brownie tin. Take the dough layer out and set aside. Repeat this step with the second half and leave it in the tin this time. Prepare the caramel by adding all the ingredients to a high-speed blender and blending until creamy. 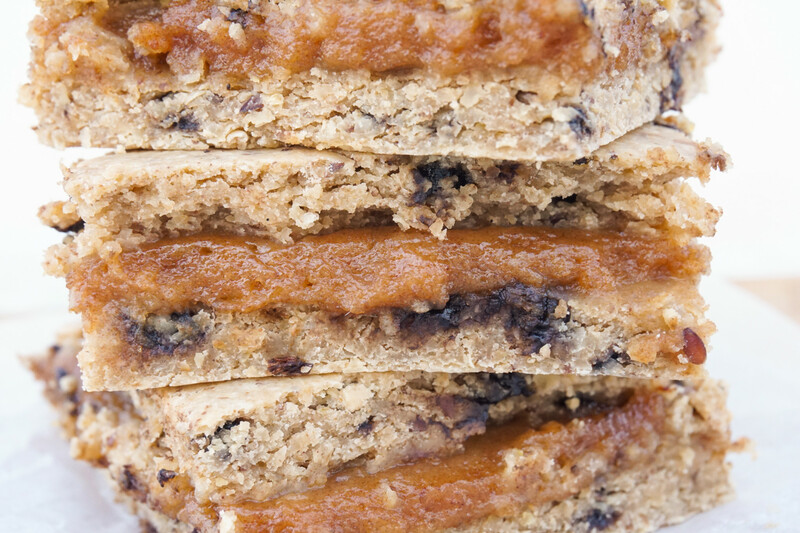 Spread the caramel evenly on top of the dough and add the remaining dough layer on top. Place in the oven and bake for about 25 minutes. Leave to cool down a bit and eat while still warm! These look amazing!! I’m definitely giving them a go! Could you please clarify the correct salted caramel ingredients. Is it coconut cream (as in recipe) or almond milk (as in video)? My dough was quite sticky despite following the instructions. However I didn’t use almond butter as I had none and used peanut butter instead – would this have made a difference? I don’t think that the nut butters made the difference as they’re both equally fatty. Was it too sticky to handle? Mine was very sticky initially but became much easier to handle the more I kneaded the flour into it. Also how did it affect the end result? I just made these and they are delicious. I find most recipes to be too sweet and these were the perfect. Next time I will add less unsweetened almond milk because my dough was too sticky (so I added more ground oats). I also would like to try this without the chocolate and use a jam filling or chunky unsweetened apple sauce instead of the date mixture. Thanks for the recipe! Can i use vanilla extract instead of vanilla bean powder? If so, how much would you suggest? Can I make this with eggs instead of flax eggs?? Thanks! 🙂 I have never tried freezing them, so I really can’t tell. I did put them in the fridge though and reheated them and they were delicious! I’m going to make these today and am so excited! I was wondering if it would be okay to use all purpose flour instead? Only because I already have some. Will it change the flavor too much? Thanks! I just made these and thought they were excellent. I would only make minor changes and that is just because of personal taste, I prefer things less sweet. I would omit the maple syrup and reduce the chocolate chips. It really is a divine dessert. Thank you for sharing. Can you use cocoa nibs instead of chocolate chips, to avoid the sugar?